Don’t you just love all of the squash varieties this time of year?! I’m a big squash fan, I have quite a few stuffed squash recipes on the blog. I guess you either love it or hate it, but it’s one of my favorite seasonal fruits. Yes, they are actually a fruit variety. Anything grown from a flower that contains seeds is considered a fruit. Pumpkins, avocados, pea pods, corn kernels, sunflower seeds, tomatoes, etc. are all a part of the fruit family. This slow cooker stuffed acorn squash is a sweet/savory side dish that would be perfect for your holiday spread. It’s super easy to throw together and made with whole food ingredients. I’m all about trying to make your life (and my life) easier by creating recipes that are healthy and simple. I mean, we’ve got so many other things to do than cook, right?!! I love my time in the kitchen, but I’ve got to save time for the gym, my family and work, too. Speaking of saving time, this new programmable Stay or Go 6 qt slow cooker from Hamilton Beach is a valuable tool for busy cooks. I love the programmable timer feature and it automatically switches to a warm setting when the cook time is done. This way, your food doesn’t get mushy from overcooking while your away. You can set it to perfectly cook your recipe and leave it until you’re ready to eat. I also love that you can throw the insert and lid in the dishwasher. Easy peasy! Hamilton Beach is giving away one of these Programmable 6 qt Stay or Go Slow Cookers to one of my readers. Be sure and enter for your chance to win! They also are sharing a free ebook with my readers with their top 25 slow cooker recipes. Grab your free download below. 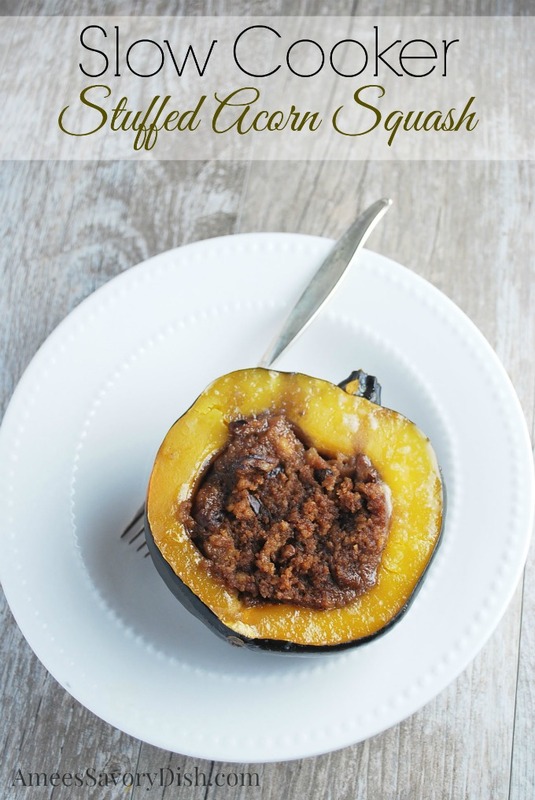 I hope that you enjoy this stuffed acorn squash recipe. Click the link below to get your entry in for the Programmable Stay or Go 6 qt Slow Cooker from Hamilton Beach. It makes a great holiday gift! *I received this product for review. All opinions are my own. My favorite recipe in the slow cooker is beef stew. 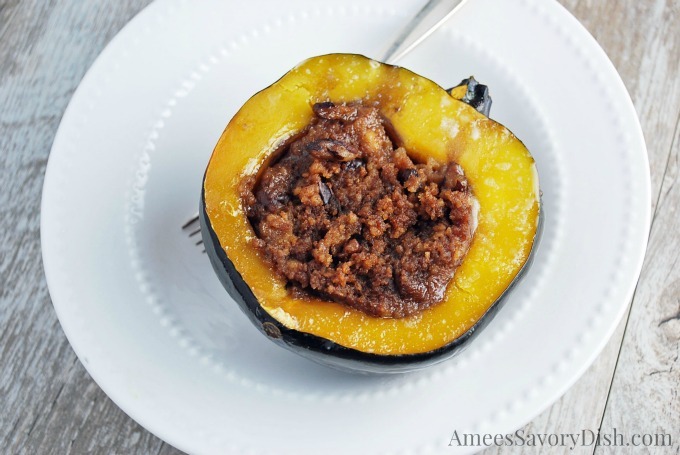 This slow-cooker stuffed acorn squash recipe looks amazing! The only problem … I’m allergic to walnuts! My favorite is Slow Cooker Honey Garlic Chicken and Veggies. I like making a lot of stuff in a slow cooker, but I must say that vegetarian chili comes out best when you use a slow cooker and along low cooking time. I love to cook beef stew. The kids love it and we have it monthly. my favorite in the summertime is bbq pulled pork but in the winter time its chicken wild rice soup 🙂 these stuffed acorn squashes look AWESOME though! My favorite is probably pulled pork, but that’s just because it’s what I make the most in my slow cooker. Crossing my fingers because my slow cooker bit the dust and I desperately need a new one before winter really sets in! Mine was ANCIENT! Your stuffed acorn squash looks awesome…I never think to do anything like that, but my old one didn’t have any of the controls either. When I get a new one, I’ll be willing to try a lot more stuff in it! I love slow cooker food, one of my favorites is a pot roast, always comes out moist. 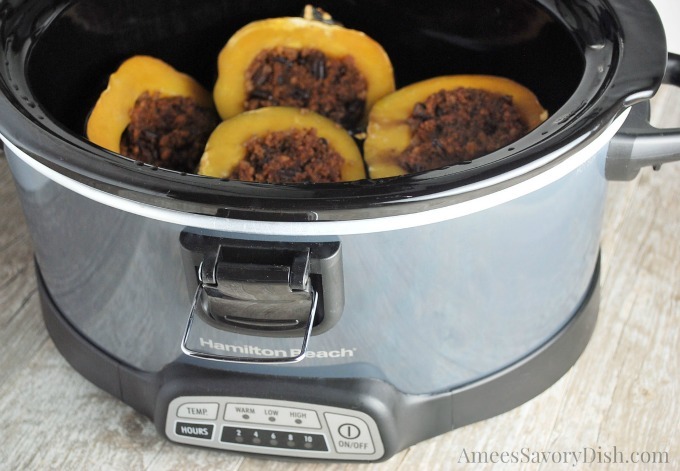 We love acorn squash but have never made in the crockpot. I have one sitting here and will be making it tomorrow with this Amazing recipe! One of our many favorites in the crockpot are stuffed peppers the Somersize way and a ribrecipe that is to die for. Thanks for All the great recipes!! Rotel Dip! Once that cheese is melted you can’t drag me away from the crock pot. I love making pot roast that falls apart when it’s finished. Slow Cookers for the win!! I just used mine today to make shredded bbq chicken to use for quesadillas, sandwiches, and pasta this week. Such an easy way to get some food prep done while working. I think I may try this squash recipe for our Thanksgiving dinner this year – looks so good! Thank you Heather! Love shredded bbq in the slow cooker, too! Yum! Just made pumpkin butter in the slow cooker. Applesauce is another favorite. I like to make broth. My family loves it when I make pot roast in my slow cooker. There is nothing better than coming home afer a long day at work to the delicious smell of pot roast. I love to make Chili Con Carne in the slow cooker! one of my favs, too, MaryAnn! This time of year I like stews and chilis, but overall I like roasts and tenderloins because they come out so tender and juicy.